Thank you for visiting the BrakeMill.com website; your money-saving source for professional press brake repair services. Our techs have the experience and resources to provide with diagnostic services, complete restoration, and effective maintenance to keep your investment running smoothly. Sometimes simply diagnostics can be handled with a quick phone call, but if on-site inspection is required, we’re ready to get on the job quickly. Getting your equipment up and running properly is our first priority and our technicians will move quickly to keep down time to a minimum. Whether remilling is the answer or replacement parts, The Brake Mill has the resources to restore your expensive machines operational capabilities. The Brake Mill specializes in press brake bed & ram machining. Historically, the bed & ram would have to be removed from the machine and sent out to be repaired. This results in significant cost and down time. Brake Mill is a patented milling machine specifically designed to machine the bed & ram of press brakes in place with little down time and significant cost savings. With over 30 years’ experience of having repaired over 2000 Press Brakes throughout the United States we machine all types of CONVENTIONAL and BOTTOM acting press brakes. The Brake Mill has extensive experience in the field of press brake remilling. Our operators maintain the skills and techniques required to properly remill your machine. Our operators will work extended hours/ weekends to minimize the time your brakes are down for repair – at no extra charge. There is only one reason to have press brakes in your shop (or any other equipment) – to make profits. Profits will vary with productivity and production is dependent on the condition of your equipment. A press brake in poor condition will require longer set-up times and more set-up pieces. Greater operator skill is needed. Die life will be shortened. Rejections and scrap increase. Just a little of this can actually remove all profitability from your bending operations. 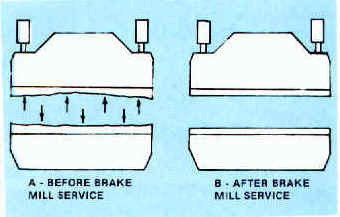 So, before you spend all that money to replace your worn brakes with new units that are basically the same designs, why not have us remill it? Sound sensible? Call us at (972) 315-2756 for a Free Brochure and a Free quote!